People around the world are generally disgruntled about the state of their economy, but levels of dissatisfaction vary widely by region, according to a new Pew Research Center report. And many of those who are dispirited about current economic conditions are also quite pessimistic about the financial prospects of the next generation. Europeans are by far the most dissatisfied: A median of 70% in six countries say current economic conditions in their countries are bad. The Italians (88%), French (85%) and Spanish (81%) are the most downbeat. Only the Germans are particularly satisfied, with 75% believing their economy is in good shape. In the Middle East, views are also negative. A median of two-thirds lament the state of their economy. Most concerned are Lebanese (89% say the economy is bad), Jordanians (73%) and Palestinians (67%). Similarly, Latin Americans (median of 63%) say their economy is in bad shape. Brazilians (87%) and Venezuelans (83%) have particularly negative views. Americans and publics in Africa are less dissatisfied, but they are hardly happy about the way things are going. More than half of Americans (56%) say the U.S. economy is doing poorly. In the nine African nations surveyed, a median of 51% believe economic conditions are bad. Within Africa there is a particularly wide divergence of opinion. More than seven-in-ten Ghanaians (73%) judge their economy to be performing poorly, while nearly nine-in-ten Ethiopians (89%) believe their economy is in good condition. Only in the Asia-Pacific region do about half (51%) regard their economy as good, yet almost as many (47%) say conditions are bad. Again, there is a diversity of views. Chinese (90%) and Vietnamese (86%) overwhelmingly voice the opinion that economic conditions are good. But 83% of South Koreans believe their economy is in bad shape. The differences between regions extend to how people see the financial prospects for the next generation, the Pew Research survey of 40 nations found. Europeans are not only the most negative about the present, but also the most pessimistic about the future: A median of 64% believe that today’s children, when they grow up, will be worse off financially than their parents. The French (85%) are particularly concerned about the future. Americans (60%) are almost as worried as the Europeans about prospects for the next generation. More than four-in-ten (median of 44%) in the Middle East think the next generation will be worse off. This includes 52% of Turks, 47% of Lebanese and 44% of Palestinians. But 51% of Israelis think today’s children will be better off than their parents. Publics in the Asia-Pacific region have a relatively bright view of the future. By nearly two-to-one, they are optimistic about financial prospects for the next generation: A median of 51% say today’s kids will be better off, while just 24% believe they will be worse off. The Vietnamese (91%) and Chinese (88%) are particularly hopeful. The Asians with the greatest doubts are the Japanese: Just 18% are hopeful for the next generation. 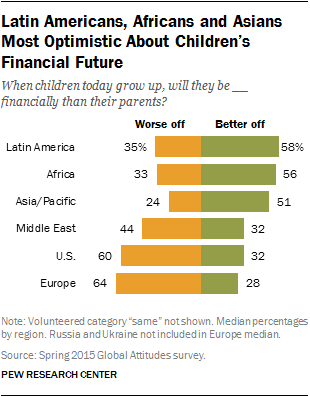 A majority in Africa (median of 56%) also see a better financial future for their children. In fact, half or more in six of the nine African nations surveyed feel that way. Optimism is particularly prevalent in Ethiopia and Nigeria (both 84%). But publics are more pessimistic than optimistic in Kenya (47% to 43%) and Tanzania (45% to 33%). Latin Americans are the most hopeful for the next generation. More than six-in-ten Chileans (67%), Peruvians (65%) and Brazilians (61%) think that today’s children will be better off financially when they grow up than are their parents. Venezuelans (48% say the next generation will be worse off) and Mexicans (43%) are the least optimistic.